The trumpet flowers of Asarina as popular with hummingbirds and butterflies as they are with gardeners. Gardeners are always looking for great vines to grow and add height in the flower garden. 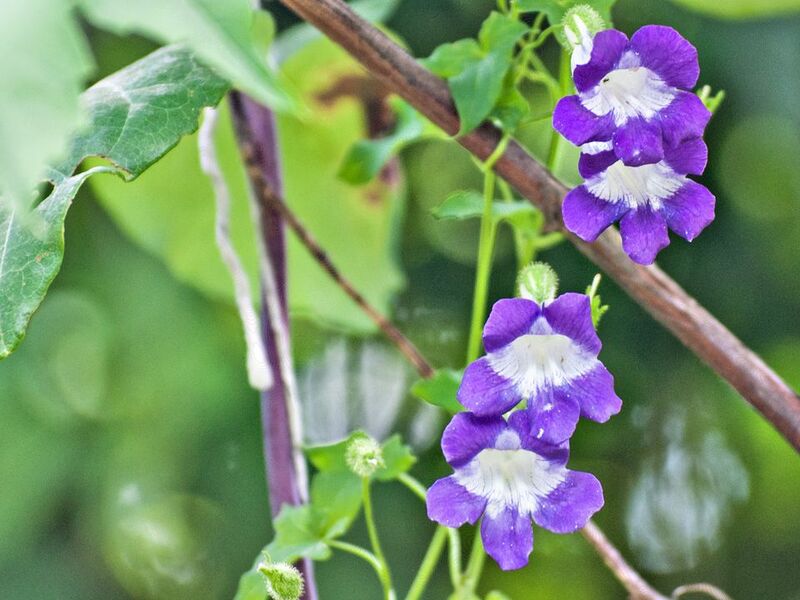 Easy to grow Asarina, the climbing snapdragon vine, offers profuse flowering throughout the summer. Proving that everything old is new again, Asarina is making a grand comeback from near obscurity. Trumpet shaped flowers always seem to add an old fashioned charm and Asarina adds delicate vines and leaves to create a totally beguiling vine. It looks almost too fragile to hold on, but have no fear, this vine is a survivor. And its trumpet blooms are hummingbird favorites. Asarina scandens have actually been reclassified as Maurandya scandens, but gardeners have lost patience with taxonomists and continue to grow and sell them as Asarina. Flowers: The 1 - 2 inch flowers are trumpet-shaped with 5 lobes. They droop downward on the vines, giving the effect of flowing. Climbing snapdragon vine blooms in shades of pink, blue, lavender and white. Leaves: Bright green pointed heart or arrow head-shaped leaves. USDA Hardiness Zones 9 and higher. Asarina is usually grown as an annual and is frost tender, but it can self-sow. Full sun to partial shade. In hot climates, Asarina prefers partial shade during the afternoon. Repeat blooms May through Fall. 'Joan Lorraine' - Most commonly sold variety. A rich, purple-blue. This is a very versatile vine. You can use it in hanging baskets, it will grow up almost anything, and it also sprawls and makes an attractive ground cover. It's often billed as a good choice for small gardens because of its dainty foliage, but this feature also allows it to work well in a border, without taking over. The colors currently available lean toward the cool side and pair well with silver or gray-leaved plants like Artemisia, Russian sage and lavender. Soil: Snapdragon vine is fairly indifferent about soil pH and has even been known to thrive in poor soil. However providing a good amount of organic matter at planting will help send it climbing faster. It also needs well-draining soil and will rot if the soil remains wet. Asarina does not like having its roots disturbed, so starting seed in peat or paper pots is recommended. Individual pots will also cut down on tangled vines. Plant the seeds so they are just barely covered with soil. They should germinate within 2 - 3 weeks. They are slow starters, but they will eventually take off. It helps to provide some type of support in the pots, if the vines start growing before you can get them into the ground. You can also take stem cuttings and start new plants. You can even over-winter potted plants indoors. They won't bloom as profusely, but they make nice hanging baskets. Climbing snapdragon will require some type of structure, if you want it to climb. The thin vines twine best on thin supports. They can't seem to grab hold of anything thicker than about 1 inch in diameter. Asarina won't require much additional care. Mulching the roots will help retain water during hot spells. And a feeding with a complete fertilizer or a side dressing of compost mid-season will give it a boost to keep blooming. Climbing snapdragon is virtually pest free. With sunshine, regular water and well-draining soil, it should grow and bloom throughout the season. Would You Like to Grow the Most Popular Clematis Ever?